Setting out to make a two-player game can be straightforward, but it also requires the designer to consider that, if the design is too conflict oriented, it won’t be a hit for playing with a loved one. Steve Finn, of Doctor Finn’s Games, is just the quasi-mad philosopher-scientist to take on the challenge. 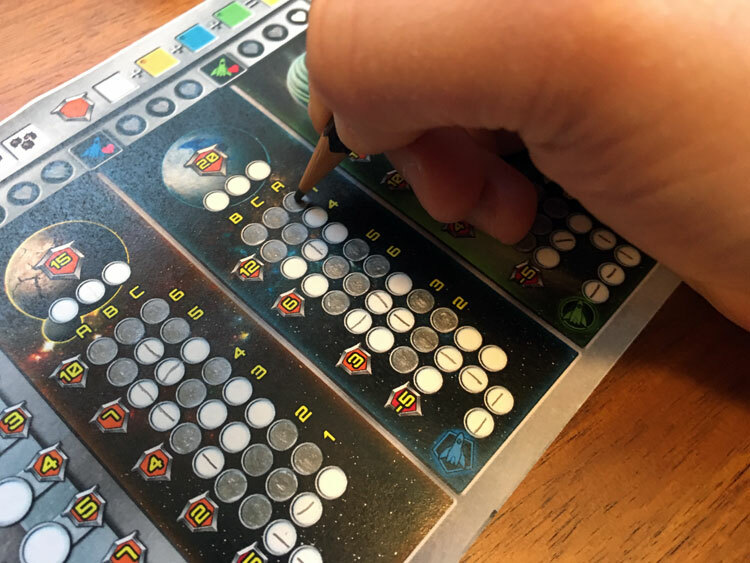 His latest exploration, a two-player dice game set in the same thematic universe as his previous work, Cosmic Run, aims to find a happy medium for two gamers on a quiet evening. Cosmic Run: Rapid Fire is a two player dice drafting game with players competing to pilot their three spaceships to sanctuary planets past a minefield. Even if players don’t reach the planets, achieving certain goals earns points and the player with the most points (or hasn’t lost by other means) wins the game. Included with the game are sheets of paper and dice. 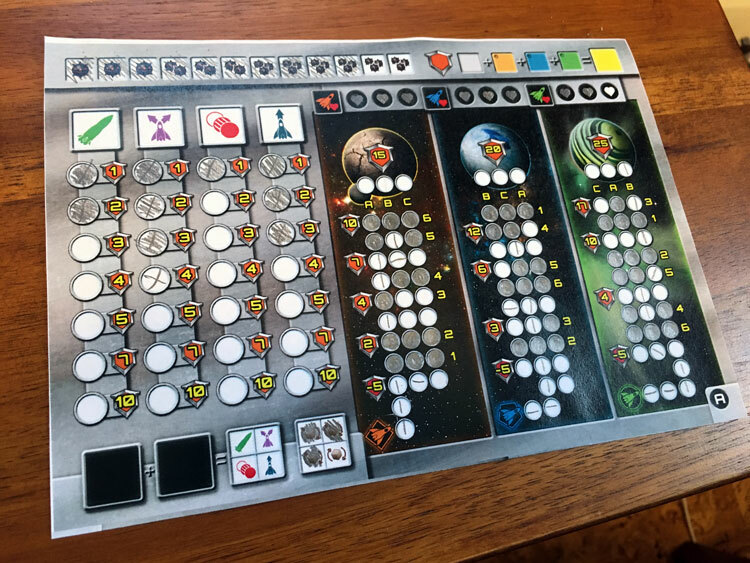 These sheets are thematic score pads that track the movement of three ships for each player, as well as technologies, rerolls, and cargo storage. Each round, players will keep track of the decisions they’ve made from dice selections until one player loses or 12 rounds have passed. Each round, the starting player rolls two “Mine Dice” which indicate the coordinates (letter and number) that new mines appear on the players’ sheets. Both players fill in their own sheets by filling in circles as if they were taking a standardized (Scantron anyone?) test. This indicates the space is unavailable for ship movement. Filling out the minefields by bubbling in empty circles feels like you’re taking a standardized test but a fun one. Players’ ships begin at the bottom of three tracks that progress vertically to planets of three colors. Players must move their ships by selecting dice and marking the movement on their sheets. Normally, players’ ships can move only vertically or to the side, but through the use of technologies, players can find ways to bypass the mined (impassible) spaces. This is important because, over the course of the game, the number of mined spaces starts to increase rapidly. 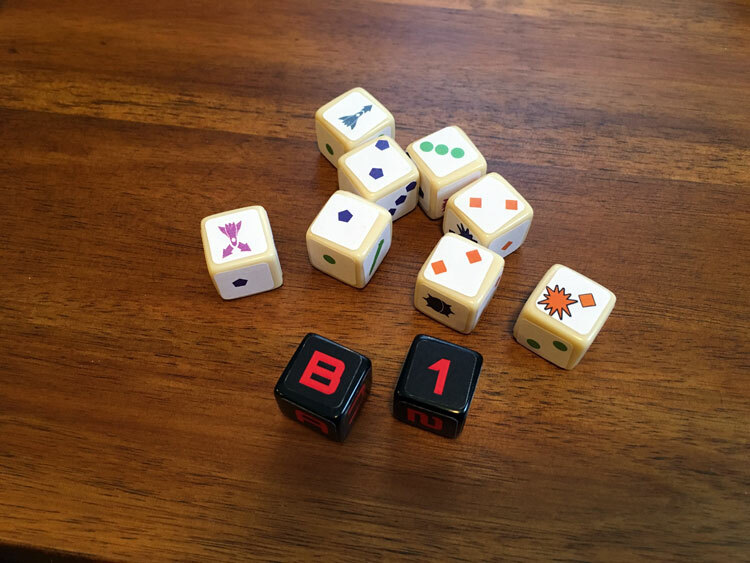 After the mine dice are rolled, the start player rolls a set of eight dice that offer different ship actions. Each player takes a turn selecting a die and then the turn passes to the next player. At the end of the round, each player will have selected four dice. Dice with points of a particular color offer that number of spaces of movement to a ship of the matching color. Dice showing an explosion symbol deliver one point of damage to an opponent’s ship of the matching color. However, after a certain number of rounds have passed, it becomes more and more difficult to move each ship. Either mined spaces or the requirement that players ships must stay within five rows of each other will limit a players options. This makes dice selection and strategy really engaging. It’s at this point that players will increasingly want to use some of the technology sides of the dice. Technologies serve two major purposes in the game, to give players more options or to protect ships from negative situations. Missiles negate opponent attacks. Navigation and Warp Drive give you diagonal movement or the ability to skip a space respectively (for avoid mines). Finally, the Transformer tech allows you to change the color of a movement or attack result to any other color. This is great for late in the game when players need to pull off some big plays to reach planets. Finally, a built in cargo bay for converting two dice to a free tech symbol is included, along with four reroll chances usable on any roll. At the end of the game, the largest point awards come from reaching planets, but players can also stockpile points from collecting technologies. Players should also be sure they haven’t lost any ships to opponent attacks because each destroyed ship incurs a point penalty. Even scarier, three destroyed ships and a player loses the game immediately. The end of the game shows how far each ship progressed to the sanctuary planets as well as your uses of technologies. While it may not seem like it, the increasing limitation to movement as delivered by the mine dice is really an exciting part of the game. It ratchets up the tension with players who know they really need to grab certain dice early if they are to progress a certain ship. Additionally, grabbing that crucial technology is also key to staying competitive. The other thing that comes to mind are the decisions whether or not to continually invest in certain technologies to shore up end game points which may be in deficit from a destroyed ship or a ship that hasn’t made enough progress. This is where rerolls can come in handy (four are available); especially by taking a die an opponent needs just to reroll it. The stickered prototype dice were functional but looking forward to the final production dice. As an added bonus, if the basic game ever gets too easy, the alternate (advanced) sheets provided make the mine dice even more deadly. Instead of just one space getting filled in, it’s possible that two spaces get mined and start to really make movement difficult. If there’s one caveat, players who don’t like direct attacks on opponents or on themselves should take note that there is some direct conflict in this game. The “Attack” die result can be avoided by the opponent with Missiles. However, if a player is reluctant to attack, they can also use one of their four rerolls. Since a player loses outright if their three ships are destroyed, it provides another game end condition in much the same way that a Military Victory works in 7 Wonders: Duel. In my opinion, that’s a great addition by adding that additional path to victory. 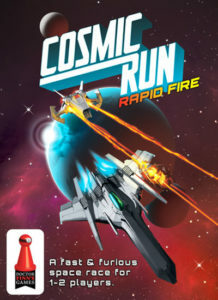 I was pleasantly surprised with Cosmic Run: Rapid Fire. It wasn’t until later that I realized that Steve Finn is the same designer as Biblios, which is also one of my favorite small dice-slash-card games. Rapid Fire delivers exactly what is expected. It’s not going to roll you over with crazy new mechanisms or get too complex for a nice chill evening. It’s got that perfect mesh of strategy while not going too deep. Put on the cosmic ambience soundtrack and it’s definitely game on. Cosmic Run: Rapid Fire is now in funding on Kickstarter, so head over today if this sounds like a game you would like to back.